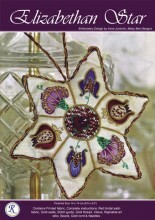 Stunning Pincushion, Christmas Tree Star or stunnign decoration. Contains Printed Fabric, Complete Instructions, Red Bridal Satin Fabric, Gold Sadis, Stitch Guide, Gold Thread, Vilene, 10 Art Silks, Beads, GOld Cord & Needles. Stitch & Bead! Click the button below to add the Elizabethan Star Kit to your wish list.